Accurate diagnoses and effective individualized treatment plans often require a combination of comprehensive diagnostic and imaging tests. The Zangmeister Cancer Center provides diagnostic imaging so that we can quickly determine the physical characteristics and implications of a patient’s condition. Because everything we need is right here, there’s no need for patients to travel between offices and hospitals for imaging. An X-ray is a quick and easy procedure that produces images of the inside of a body. X-rays are used to diagnose diseases by taking pictures of the inside of the body. Pictures produced by Digital Radiographic film with small amounts of radiation are used as a diagnostic aid. These images can be taken with the patient sitting, standing or lying on a table, depending on the instructions of your physician. Bone densitometry, also called dual energy X-ray absorptiometry (DEXA), is the most common test for tracking bone density over time. A DEXA scan measures the density of minerals, such as calcium, in your bones and provides your doctor with information for your osteoporosis management plan. 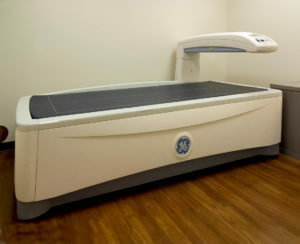 For the test, a patient lies down on an examining table, and the scanner rapidly directs X-ray energy from two different sources in an alternating fashion at a set frequency toward the bone being examined. The absolute amount of bone – as measured by bone mineral density (BMD) – generally correlates with bone strength and its ability to bear weight. By measuring BMD, it is possible to predict the risk of fracture in the same manner that measuring blood pressure can help predict the risk of a stroke. It is important to remember that BMD cannot predict the certainty of developing a fracture; it can only predict risk. 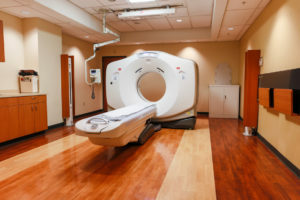 CT scans – sometimes called CAT scans – are noninvasive medical tests that help physicians diagnose and treat medical conditions. CT scans use special X-ray equipment and powerful computers to create cross-sectional pictures of the body. CT scans of bones, soft tissue, internal organs and blood vessels provide greater clarity and reveal more details than regular X-rays. 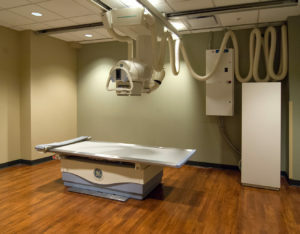 During a CT scan, a patient lies still on a table while the table slowly passes through the center of a large X-ray machine. Some CT scans require the use of a contrast dye (oral, IV or both), which makes parts of the body show up better in the image. CT scans are painless, and the only preparation usually required is four hours of fasting before the procedure. Screening means testing for a disease when no symptoms exist. The low-dose CT scan can screen for lung cancer. In a study performed over a period of several years, high-risk adults who had low-dose CT scans annually for three years had a 20 percent lower chance of dying from lung cancer than those who got chest x-rays. The low-dose CT scan cancer screening costs $99 and is not covered by insurance. We can accommodate patients before and after work for their convenience. If you have any questions about this test, please contact the Radiology Department at (614) 383-6122. 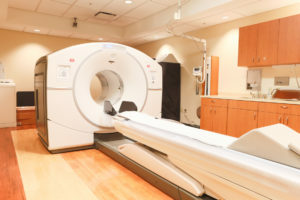 Positron emission tomography (PET) is a nuclear medicine imaging technique that produces a three-dimensional image of functional processes in the body. 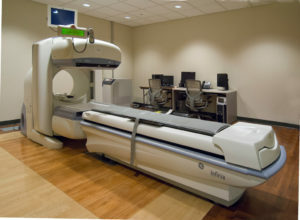 In modern scanners, three-dimensional imaging is often accomplished with the aid of a CT X-ray scan performed on the patient during the same session, in the same machine. A PET/CT scan allows the physician to distinguish between living and dead tissue or between benign and malignant disorders. Since we are looking at function related to glucose uptake, we ask that patients have nothing to eat or drink (other than water) for six hours prior to the scan. A technologist will call the patient the evening prior to the scan to review the process and any necessary preparations. Nuclear medicine imaging (also called radionuclide scanning) is an effective diagnostic tool because it shows not only the anatomy (structure) of an organ or body part, but the function of the organ as well. This additional “functional information” allows the radiologist to diagnose certain diseases and medical conditions, including many types of cancer, much sooner than other medical imaging examinations that provide mainly anatomical information. These tests include Bone, MUGA and Liver scans. Nuclear medicine studies can be valuable in the early diagnosis, treatment and prevention of numerous medical conditions and continues to grow as a powerful medical tool. We inject our patients with a small amount of radioactive isotope and scan them afterward. Other than the prick of the IV, the procedure is painless and poses very little risk. 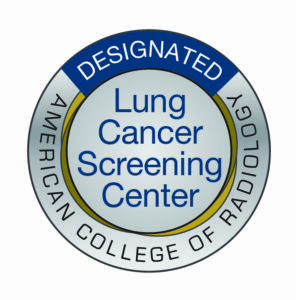 The Zangmeister Cancer Center is an accredited facility in Radiology and a designated Low-Dose Lung Cancer Screening Center by the American College of Radiology (ACR). To achieve this standard of accreditation, image quality, personnel qualifications, adequacy of facility equipment, quality control procedures and quality assurance programs are assessed through a rigorous review process. ACR accreditation signifies that The Zangmeister Cancer Center provides imaging services at the highest standards of the radiology profession. 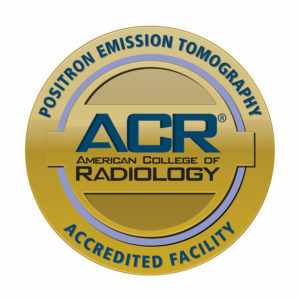 ACR fully-accredited programs at The Zangmeister Cancer Center are: Low-Dose CT Scan Lung Cancer Screening, Computed Tomography (CT), Positron Emission Tomography (PET), and Nuclear Medicine (NM).